The NUI Galway Library invites you to a seminar which will take place on Thursday 8th February at 13:00, G011 Hardiman Research Building. Please register via this link, a sandwich lunch will be provided – please let us know if you have any special dietary requirement. 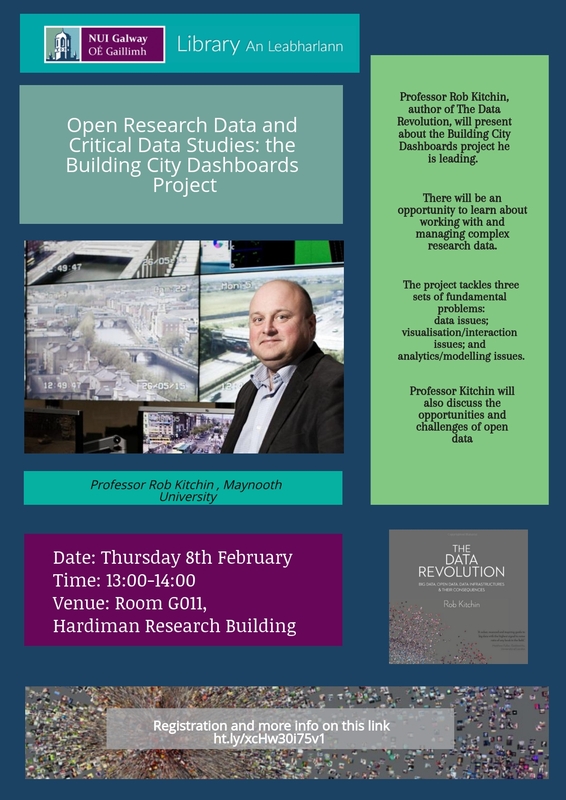 Professor Rob Kitchin, author of The Data Revolution, will discuss the Building City Dashboards project he is leading. There will be an opportunity to learn about working with and managing complex research data. The project tackles three sets of fundamental problems: data issues; visualisation/interaction issues; and analytics/modelling issues. Professor Kitchin will also discuss the opportunities and challenges of open data. Biography: Rob Kitchin is professor and ERC Advanced Investigator at the National University of Ireland Maynooth. He is (co)principal investigator of the Programmable City project and the Building City Dashboards project, and was a PI on the Digital Repository of Ireland. He has published widely across the social sciences, including 26 authored/edited books and over 180 articles and book chapters. He was the editor-in-chief of the 12 volume, International Encyclopaedia of Human Geography, and is presently editor of the journal, Dialogues in Human Geography. He was the 2013 recipient of the Royal Irish Academy’s Gold Medal for the Social Sciences.